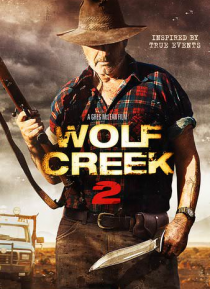 Lured by the promise of an Australian holiday, exchange student Paul visits the notorious Wolf Creek Crater. His dream Outback adventure soon becomes a horrific reality when he encounters the site's most infamous local, Mick Taylor. When Paul attempts to flee, Mick pursues him across a hostile wasteland. After seeing the true magnitude of Mick's monstrosity, Paul's only hope of surviving, where no… one has before, will be to use every ounce of cunning to outwit the man behind the monster.